This woodcut has both a symbolic and a familiar reference. 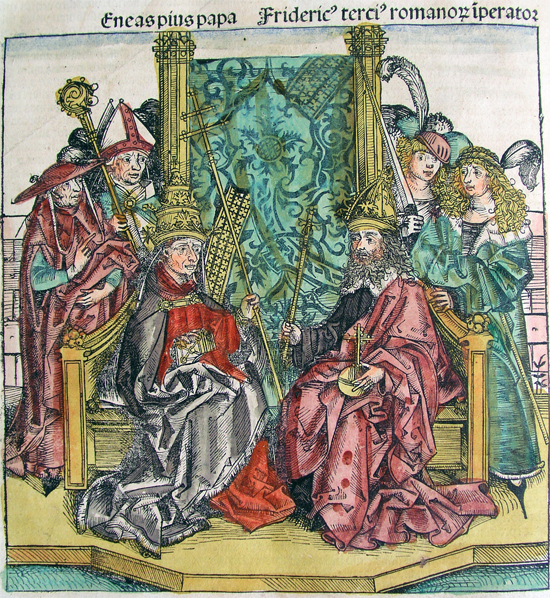 It shows the Holy Roman emperor and the pope as the co-rulers of Christendom, and it gives them the faces of Emperor Frederick III (r. 1440-93) and his former secretary, Enea Silvio Piccolomini of Siena, who became Pope Pius II (r. 1458-64). The woodcut was published in one of the best-known printed books of the era. Written by Hartmut Schedel and published in 1493, the book had no official title but is known as either the Nuremberg Chronicle (after its city of publication) or the Book of Chronicles [Liber Chronicarum] (after a phrase that appears at the beginning of the book). The book is known in German as Schedelsche Weltchronik [Schedel’s World Chronicle]. In it, Schedel offered a history of the world from creation to the last judgment. The illustrations were produced by Michael Wohlgemut (1434-1519) and his stepson Wilhelm Pleydenwurff (c. 1450-1494). Woodcut by Michael Wohlgemut, Liber Chronicarum 1493, p. 268b.